In music, a serenade (or sometimes serenata) is a musical composition and/or performance in someone's honor, originally songs of courtship, but evolving later into sophisticated musical works. Serenades of the eighteenth and nineteenth centuries were more than likely written in a light mood and usually for an evening's entertainment, as opposed to an aubade (a morning song). In music history serenades have been composed for ensembles of many differing configurations and are generally multi-movement works. A Baroque serenade was a type of cantata performed outdoors. From the Classical period until now, a serenade usually refers to a multiple-movement work for a large instrumental ensemble, related to the divertimento. In general parlance, a serenade is a musical performance, either vocal or instrumental, in the open air at night, as by a lover under the window of his lady. As a verb, "to serenade" has come to mean simply to sing a love song to someone. Wolfgang Amadeus Mozart composed some of the best known serenades of the eighteenth century. The word serenade comes from the Latin word serenus meaning "serenity." Originally, it referred to a vocal composition performed in honor of a lady or one's lover. It later evolved into an instrumental form. Early serenades were usually sung at night to express love or devotion, and this tradition continued during the Baroque and early Classical periods, even as serenades began to become more sophisticated, multi-movement works performed for larger audiences. The serenade in its original sense can be heard in Wolfgang Amadeus Mozart's Don Giovanni, where the aria "Deh! vieni alla finestra" is most provocative. In the late eighteenth century, the term serenade was used to describe instrumental music such as the divertimento, the cassation and the notturno. By the Romantic era, the serenade was used for orchestral works such as those for strings (Elgar's op. 20), wind instruments, (Strauss' op. 7), or for a full orchestra, as in several of the works of Brahms. Subsequently, the serenade came down to a smaller scale as in Benjamin Britten's Serenade op. 31 for tenor, horn and a string orchestra. 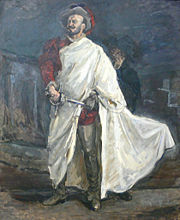 Francisco d'Andrade as Mozart's Don Giovanni. The opera features one of the most famous examples of the original sense of the serenade in the aria "Deh! vieni alla finestra." 1) In the oldest usage, which survives in informal form to the present day, a serenade is a composition performed for a lover, friend, or other person to be honored, typically in the evening and often below a window. 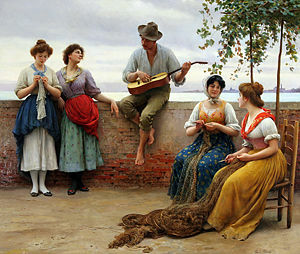 The custom of serenading in this manner began in the late Medieval era or Renaissance, and the word "serenade" as commonly used in current English, is related to this custom. Music performed followed no one particular form, except that it was typically sung by one person accompanying himself on a portable instrument, for example a flute or guitar. Works of this type also appeared in later eras, but usually in a context that referred specifically to a past time, such as the above-mentioned aria in (Mozart's Don Giovanni). 2) In the Baroque era, a serenade was a type of cantata—a vocal composition with an instrumental accompaniment of more than one movement—performed outdoors in the evening, with mixed vocal and instrumental forces. This type of music was generally called a Serenata (Italian—since it occurred most frequently in Italy). Some composers of this type of serenade include Alessandro Stradella, Alessandro Scarlatti, Johann Joseph Fux, Johann Mattheson, and Antonio Caldara. Usually these were large-scale works performed with minimal staging, intermediate between a cantata and an opera. According to some commentators, the main difference between a cantata and a serenata, around 1700, was that the serenata was performed outdoors and therefore could use instruments which would be too loud in a small room—for example trumpets, horns and drums. 3) The most important and prevalent type of serenade in music history is a work for large instrumental ensemble in multiple movements, related to the divertimento, and mainly being composed in the Classical and Romantic periods, though a few examples exist from the twentieth century. Usually the character of the work is lighter than other multiple-movement works for large ensemble (for example the symphony), with tunefulness being more important than thematic development or dramatic intensity. Most of these works are from Italy, Germany, Austria and Bohemia. The most famous examples of the serenade from the eighteenth century are undoubtedly the ones by Mozart, which are works in more than four movements, and sometimes as many as ten. The most typical ensemble for a serenade was a wind ensemble augmented with basses and violas: instrumentalists who could stand, since the works were often performed outdoors. Frequently the serenades began and ended with movements of a march-like character—since the instrumentalists often had to march to and from the place of performance. Famous serenades by Mozart include the Haffner Serenade (which he later reworked as the Haffner Symphony, no. 35), and one of his most famous works, Eine Kleine Nachtmusik, which is atypical for only containing string instruments. Other important Mozart Serenades are the "Posthorn" Serenade (K. 320), which includes an extended bugle-type solo, the "Andretter" Serenade (K. 185—with its extended violin solos was a precursor to his five violin concerti), the Gran Partita for 13 Wind Insturments (K. 361) and the wind Serenades K. 375 and K. 388. Johannes Brahms composed serenades as light symphonic pieces for small orchestras without violins. By the nineteenth century, the serenade had transformed into a concert work, less associated with outdoor performance for honorary occasions, and composers began to write serenades for other ensembles. 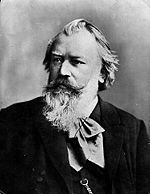 The two serenades of Brahms are rather like light symphonies, except that they use an ensemble Mozart would have recognized: a small orchestra without violins. Dvořák, Tchaikovsky, Josef Suk, Sir Edward Elgar and others wrote serenades for strings only, as did Hugo Wolf, who wrote one for string quartet (the Italian Serenade). Other composers to write serenades in a Romantic style include Richard Strauss, Max Reger and Jean Sibelius. Dvorak's Serenade, Opus 44 is scored for pairs of winds and horns, cello and contrabass. Some examples of serenades in the twentieth century include the Serenade for Tenor, Horn and Strings by Benjamin Britten, the Serenade for piano by Stravinsky, Serenade for baritone and septet Op. 24 by Arnold Schoenberg, and the movement entitled "Serenade" in Shostakovich's last string quartet, No. 15 (1974). English composer, Ralph Vaughan-Williams' Serenade to Music is scored for sixteen solo singers and orchestra. Leonard Bernstein's Serenade is scored for solo violin and orchestra. A twenty-first century example is Nigel Keay's Serenade for Strings composed in 2002. "Moonlight Serenade" is an American popular song with original music by Glenn Miller and subsequent lyrics by Mitchell Parish. The first eight bars of the melody follow the form of the 12-bar blues, written in the C-minor key. The song is a premier example of the American big band sound from the mid-twentieth century. The serenade was a musical way to honor an individual and to create music for evening entertainment, especially in the Classical music era. Wolfgang Amadeus Mozart's "Eine kleine Nachtmusik" is an example of a serenade form which is written for a stringed orchestra or string quartet with bass. The serenade was an example of smoothly flowing music which influenced many of the later Classical era composers, i.e. Ludwig van Beethoven's "String quartet in C minor," op. 18, #4, and Romantic era composers, i.e. Franz Schubert's "Die Forelle" (The Trout) quintet for piano and strings. This page was last modified on 8 September 2015, at 19:21.